BBC NEWS | Have Your Say | Should grotesque buildings be demolished? Should grotesque buildings be demolished? 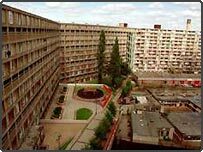 Britain's biggest eyesores should be given a "grade X" listing to speed up their demolition, according to the country's top architect. George Ferguson, President of the Royal Institute of British Architects, says that property developers should be given grants to persuade them to condemn X-listed buildings. Mr Ferguson wants the scheme to target buildings that spoil the view of classic structures, or which make public areas unwelcoming. Speaking to the Daily Telegraph, he said that Britain has "lost the art of making streets and squares which encourage people to gather." Do you think ugly buildings should be put on a blacklist? Who should decide which ones to condemn? Is there a building that you'd like to see demolished? Send us your pictures of the buildings you'd like to see demolished. Either email them to yourpics@bbc.co.uk or send them from your mobile phone on 07970 885089. What is the point in demolishing old 'eyesore' buildings just to replace then with equally ugly new ones? The Millennium Centre in Cardiff Bay is a prime example. Hailed as a masterpiece by the architects, I haven't met a single person who likes the look of it! Especially since it ruins the view of the Red Brick Pierhead building which stands in front of it. What is the obsession with preserving everything? Things change and we should move on and improve our lives, not perpetuate the misery of those who have to live in these architectural disasters! I heard that the Kings Cross Holiday Inn was on the list of targeted buildings. An absolute disgrace - it's no more ugly than any other hotel in London, and the room service is fantastic. There is a new block of flats that is in the process of being built here in Penzance, and it certainly is not a thing of beauty. Before it's been finished, it reveals itself as the eyesore it truly will become. Ask anyone in Penzance and they'll point out Penrose Court as the example of poorly-thought-out architecture it is. How about what used to be called the NatWest Tower in the City of London - an ugly black monstrosity that the IRA tried to demolish. Also how about the ugly "gherkin" now standing where the beautiful Baltic Exchange once stood. Stevenage and, in particular, the Glaxo building because it can be seen from miles and miles around. There's no escaping it! Otherwise pleasant walks in the Hertfordshire countryside are spoilt because of this eye-sore. Whoever gave planning permission? I'd vote for 'The Riverfront' (or whatever they decide to call it) a new theatre/arts centre in Newport as it's a horrible shed-like monstrosity - the sad thing is, they haven't even finished building it yet! Romford town centre. The local council demolished 17c buildings in the 1970's to build concrete eyesores. These eyesores are now being demolished to make way for new supermarket eyesores! The Atlas Centre in Didcot, Oxfordshire is a terrible example of 1940s wartime buildings turned into office blocks. Small windows that don't let enough light or air through them. Small office's that are not comfortable to work in. It's a concrete/brick monstrosity from the 1940s and should be razed to the ground! The people who seem ready to demolish anything from the 1950s are the same sort of people who wanted to tear down lots of art deco architecture in the post-war period, thereby denying future generations the opportunity to enjoy those buildings. Many buildings, such as Centre Point, and many in Croydon, need to be allowed time to grow on the public. What would have happened if St Paul's Cathedral had been torn down in the mid 18th century for being a "Baroque eyesore"? Battersea Power Station. A fine building for its original function, but it is now derelict and purposeless while taking up much space. It can be remembered and studied from photographs. My nomination would have to be Island House - a 60s monstrosity on a traffic island near Waterloo station. It has been derelict for a number of years too. This would be much nicer area if Island House was demolished and replaced by Trees, shrubs and flowers. The majority of tower blocks, especially those in the East End are not only horrible, they're depressing. But surely there can be no uglier building in the UK than the Hayworth Gallery? It's like something from a communist dystopia. Tower blocks like Centre Point are beautiful and represent our striving for shared space that aspires towards the heavens. Only small-minded people who want to live in twee thatched cottages and clutching their ID cards to their fluttering fear-filled bosoms could possibly complain! And yes, I live in a tower block! The whole of the Thamesmead estate. The place is so bad that the arrival of Belmarsh high security prison has actually improved the area! Since Belmarsh was built, property developers are building new houses there. But with the old grey monster still in place Thamsemead will always be Thamesmead to those who live nearby. Keep Centrepoint. It's how sixties architecture was supposed to be - clear, elegant lines and doesn't disrupt the landscape below it. Most importantly it has a big white lit-up sign which has helped generations of Friday night drunks work out which way is home. Lose Tower Thistle hotel - it sits lumpily by Tower Bridge spreading ugliness to the spaces around it. Ugh. Just about every building on Oxford Rd in Reading should be demolished. The local council is keen on wasting money on 'regenerating' areas which are beyond regeneration. My home town of Portsmouth seems to excel in dire buildings - but local planners never seem to learn. The sixties gave us ghastly flats on Portsdown Hill that uniquely had 'descending damp' and were duly demolished. The seventies Tricorn thankfully is on its way to oblivion. But what about the ridiculous millenium sail tower being built over the wonderful Portsmouth harbour? It's a disgrace to the surrounding historical buildings and certainly does not complement the tasteful GunWharf Quay development. On a recent trip to the otherwise stunning city of Edinburgh I was horrified to see the Scottish Parliament Building - hard to imagine how so much money could have been spent on something so totally inappropriate. The deeply vile 60s Hilton Hotel in beautiful Bath also makes me wonder what on earth is going on in planners and architects heads sometimes. Yes, let's get on with it and start with The Dome and the ridiculous Diana memorial stream - pass me a hammer! Why not just bulldoze the whole of Walthamstow and start again from scratch? The Roxy building (formerley the Fiesta) in Sheffield. A hideous white 1960s building that is just about the first thing visitors to Sheffield see either by train or bus. Start with the Trellick Tower, please! You don't get much uglier - or more frightening than that! Arlington House in Margate, Kent. A grey concrete block of flats on the seafront. No further comment necessary. Guys Hospital Tower - the dirty concrete "No.1" in SE1, topped by streaks of rust-staining - should either be demolished or extensively re-clad and finished. Appleton tower at the University of Edinburgh. It is a talking point for all the wrong reasons. Hate it. Reading Civic Centre! Please! The few remaining pre-war buildings prove that the town was once architecturally beautiful, and the Thamesside setting ought to make it a lovely location, but the concrete post-war monstrosities such as the Hexagon, the Civic buildings, and the derelict Chatham Street car park make this town an eyesore of the south. Bring on the wrecking balls! Oh, and don't forget the entirety of Bracknell while you're at it. Please knock down Archway Tower at the bottom of Highgate Hill, and its associated buildings. They are just a dirty concrete wasteland in the heart of a vibrant area. The tower seems to be falling down already, so perhaps demolition will be a natural process. Whoever owns the public spaces and square etc has neglected them and turned them into an ugly rubbish dump. A total disgrace of planning and maintenance with utter disregard for people - remember what they are, those little dots in architectural drawings? Developers in Liverpool have got the right idea. Taking the most unlikely "eyesores" and turning them into interesting and vibrant places. The rest of the UK's town planners should have a visit to Europe's capital of culture, and take some notes. I agree with the suggestion of the Millennium Dome, but my favourite for demolition would be the Lloyd's Building in the City, a hideous building with all its services on the outside of the building. It never looked good, and it's now a maintenance nightmare! The 'Gherkin' in the city of London, the former NatWest tower, all of Canary Wharf. It's quite obvious tall buildings do not work and shouldn't appear in Britain! When I open my curtains, I have a glorious view of Arthur's Seat, Edinburgh Castle, and the Scott monument. However, to destroy this almost perfect skyline are the major mistakes of Edinburgh, namely the David Hume Tower and Appleton Tower in George Square. To see these buildings standing is a vision of hell. Nothing can describe the way how these two buildings destroy the skyline of Edinburgh. The buildings in Croydon are coherent to each other and truly look nice. Old odd things in Croydon should be knocked down. In London, Centre Point and many of Southwark must totally be replaced. The Angel of the North is a wastefully publicly funded monstrosity - even the locals don't like it. If you want to see a monument that is both attractive and spectacular you should see the 'Mother Russia' in Volgograd (Stalingrad) which is also a war memorial - now that is something to attract tourists ! Everything south of Coventry. And north of Birmingham. A bit extreme, I know, but it' their own fault. Please obliterate Stretford Arndale Shopping Centre in Trafford. It is the tackiest building Manchester has to offer. A turquoise roofing system next to a yellow and grey multi storey car park that looks like it was built by a four year old, using Lego! It makes me shudder just to go past it! The one in the picture... Sheffield's *ahem* finest - the Park Hill estate which looms over the Railway station. It's an absolute eyesore, but is of significant architectural interest - apparently. We need to get shut of it, and sharpish. One I find quite repulsive in its own right is the hideous red monstrosity that is the Royal and Sun Alliance building in Liverpool. It is especially repugnant considering it is just around the block from the superb Three Graces on the waterfront at Liverpool, and slap-bang in the middle of some fantastic architecture from when Liverpool was one of the country's premiere ports and wealthiest cities. It, and several neighbours, really detract from an area that is very important architecturally. Birmingham has done wonders in their city, but what on earth is that huge monstrosity that is part of the bull ring doing still standing??? They had the right idea in changing it all, but I hear that the part still standing is listed....it's criminal!!!! The National Theatre in London is a dreadful mistake. I love going to theatre but I am reluctant to go there as it is so unpersonal and unfriendly. Big does not have to be ugly, look at the Opera de la Bastille in Paris or the Opera in Sydney, both masterpieces and the centre of culture. The South Bank is constantly being regenerated but the National Theatre has survived, for too long, take it down please and replace with a new flagship of culture and excellence for Europe. Peel House in Eccles. Just about the worst type of sixties office block you will ever see. Stalin would have been proud of it. Whilst your at it, all the high rise council flats nearby. Then the shopping centre. In fact do the whole lot and just leave the parish church. It's enough to make you see the doctor, but his surgery was design by .....you've guessed it. Tay House that straddles the M8 at Charing Cross in Glasgow. It looks like it was designed by someone in "Blue Peter" and was clad in a colour the manufacturer could hardly give away - pink! How many "classic structures" disappeared back in the 1960's at the hands of the very same property developers George Ferguson would now like us to reward for knocking down the eyesores that they constructed. All buildings have a natural life, only the whim of fashion decrees what is ugly. St John's Tower in Liverpool city centre. A grotesque 60's concrete kebab which looks like a leftover 'Thunderbirds' set. And nowadays it's capped by a huge and tacky advertising hoarding (currently pushing vodka). It dominates the skyline of a city centre which has recently been granted 'world Heritage' site status, and it is totally out of character with the excellent Victorian masterpieces around. Down with St John's tower! I must insist for the sake of humanity... the huge and hideous abandoned concrete supermarket outside the bus station in Holmfirth - aka 'Last of the Summer Wine Country'! Please, I beg you, get rid of it! The "Eagle Star" building in Cheltenham. Surrounded on all sides by lovely Regency terraces, this disgraceful, opportunistic, concrete monstrosity towers over everything. Out of scale, out of date, out of here, please. The London Assembly Building. It blocks the view of Tower Bridge- and overshadoes it almost as an act of defiance to beautiful architecture. Turn the HMS Belfast's Guns about 90 degrees- that ought to do it! It looks like a brick dunked in concrete! The Bristol Royal Infirmary. Despite being a listed building, this 1960´s monstrosity is as horrendous on the outside as it is on the inside. It's like a dungeon - no natural light and from the outside it looks like a brick dunked in concrete! The whole of Bracknell city centre, and all of Barton and most of Cowley in Oxford. I agree wholeheartedly with Graham from Oxford. Bracknell town centre is the biggest blot on the Berkshire countryside. It shoudl be torn down and started again, hopefully not by someone with their eyes closed! The new police station at Middlebrook. About as far away from where people live as it's possible to get, and with a "modernist" jokey exterior which makes you want to whistle the Dixon of Dock Green tune. Useless and ugly. It should be easy enough to knock down - they haven't quite finished building it yet. The National Theatre is a concrete monstrosity and even from the inside you can't see out because there are great bars of concrete across the windows making a view of the river and the surrounds impossible. Houses of Parliament. Who would know, who would care? Please demolish all out-of-town shopping centres! The B&Q, Tesco, Matalan conglomerations are a true blot on the landscape. As the UK already has 31% of the total retail area in the EU they surely won't be missed. You never know, perhaps people will find other 'leisure activities' to enjoy at weekends ... or is that wishful thinking? I'd like to see Metropole Court gone - an ugly block of flats quite out of keeping with Eastbourne's dignified seafront - and it blocks the view from my window too! Perhaps there is a BBC2 programme here? "Devastation" I'm sure that the Restoration team would love to play. Bids could be made and the highest bidder allowed to press the detonator! The monstrous concrete lump of a library! Let's have something more like the glorious building bombed in the war. The Renfrewshire council offices and police station complex in Paisley, Scotland. Not only are these 70's concrete monstrosities, they completely block the view of one of the town's major assets, the river Cart. The Gate in Newcastle should be grade X, it's only a couple of years old but a monstrously out of scale building. Birmingham New Street station - no matter how many times they cover the concrete with plastic sheeting, the building still looks just as bad with blackness caused by the trapped fumes. The Mathematical Institute in Oxford - it may have looked modern 30 years ago, but not now! The contrast with the more traditional university buildings could not be starker. Was it John Betjeman who wrote "come friendly bombs and fall on Slough, it isn't fit for people now"? This debate is as old as architecture, and one man's meat is another man's poison! It's got to be a local decision ultimately - draw up shortlists at a national level, and then let the local citizens decide whether their building is a carbuncle or jewel. I quite like olde-worlde pastiche in the right place, and modern stuff in it's right place - but don't just erase old buildings because they are old - most of them can be rescued and re-used in a more modern way if only someone is willing to make the effort. The Tower Thistle Hotel next to Tower Bridge & the Tower of London. A Seventies concrete carbuncle spoiling the view of both and obliterating an attractive marina behind. There are so many attractive new buildings... why plonk a monstrosity like that right next to a couple of Britain's top landmarks? I'd like to see Swindon's towering landmark visible from miles around, the 83m high David Murray John tower demolished. It's supposed to be an iconic symbol of Isumbard Kingdom Brunel's achievements in the town. It's an ugly monstrosity, and insult to Brunel; Swindon deserves better than this 1970 blot on the landscape! I'd like to see a new modern skyscraper instead. My neighbour's house, which completely spoils a beautiful view over a loch and mountains! About time too but you're forgetting one important catch. Any building winning the annual award should have the architect stripped of their licence to practise. That was you discourage them from designing rubbish in the first place. If we thought ahead and constructed buildings from lego, architectural monstrosities could be quickly and easily dismantled and replaced as needed. Additionally, the Scottish parliament might possibly have come in on budget if lego had been used, and it would have helped to keep the kids (sorry, I mean politicians) amused for a while. Demolish all the free-standing shops in the main London rail terminuses. They make it harder to move around when it's crowded, and block the view of both the indicator boards and the fine columns and roof of the stations. The shops in Glasgow Central station are much better integrated into the building. Would anyone nowadays get planning permission to build the Eiffel tower? Due to popularist demands, the only striking building in Portsmouth is currently being torn down. It is to be replaced by yet another bland and faceless (and unnecessary) shopping centre. The Tricorn centre was voted the third most ugly building in the UK, but at least it had character. What is ugly? Would anyone nowadays get planning permission to build the Eiffel tower, or Blackpool tower, or Tower Bridge? All three bold designs in steel and Iron that do not fit into their surroundings. Sorry Barry from Havant. I was one of the populists who cheered at the news that the Tricorn in Portsmouth was coming down at last. It cheapened the image of the town and was a national joke. The chances of the council actually demolishing it are somewhat slim though, going on past achievements. In the meantime, the whole crescent of fifties houses that surround the Cathedral could do with reducing to component parts for the same reason. Knock down the new Selfridges building in Birmingham, it looks like a Zeppelin that's just crashed into the side of the shopping centre and they haven't had time to remove it yet. Given the chance, I would knock down Centre Point tomorrow. It is a tremendous eyesore that overwhelms the whole area of what is an important intersection between Oxford Street, Charing Cross Road, and Tottenham Court Road. The underpass below it stinks of urine and the whole building has bad Feng Shui. It should be demolished and a new square laid out in its place. Worcester's answer to the Guggenheim art gallery in New York City, the hideous decaying concrete spiral ramp on the Cathedral Plaza car park. It's completely out of place towering above the neighbouring half-timbered Tudor buildings in the oldest part of the city. All of Milton Keynes has to go. A terrible town, no atmosphere, culture or sites of interest, the grid system makes it seem like something out of the book 1984. If we can't demolish it, then maybe just put a concrete wall round it, to stop any innocent passers by stumbling in by mistake. One has to remember that buildings that are grotesque to some, are not to others. In my mind the worst buildings are concrete shopping complexes that many towns seem to rave over. (but then is that because they bring in the finance? The new Scottish Parliament building is awful!! Queensberry House looks like a Travel Inn, the MSP offices look like stacked up portakabins - and what are those "feature panels" all about? Never mind demolishing it, because it will probably fall down in 10 years anyway!! A problem with many of the 1960s and 70s monstrosities is that they are full of asbestos. Demolishing them safely is often more expensive than the replacement building. The new Travelodge Hotel that's just gone up as part of a new Cambridge city "development" needs demolishing, and it's only been up for 3 months! How a building that looks as if it were made out of Lego could ever pass for architecture in a town of such historic beauty is frankly a mystery! Please demolish St. Bartholomew's Church in Brighton. As huge, ugly, brick monstrosities go it must be in the top ten. All I can say is that planning regulations must have been non-existent in the 1870's. It looms over the town like a huge red coffin. Anything built on a railway line closed in the 1960s which now prevents it from being re-opened. Anything built on a railway line that was stupidly closed in the 1960s which now prevents it from being re-opened. The Houses of Parliament at Westminster in London - a totally superfluous building now we have our main parliaments in Edinburgh and Brussels. Teville Gate in Worthing. They've been talking about demolishing and redeveloping it for years and yet it is still there! It's become so run-down that it just looks so bleak and depressing during the day, and as for during the night, well, the place is just so unwelcoming that you can't really walk through there without feeling concerned for your own safety. This is even more annoying when its the most direct route from the station to the town. Demolishing it and redeveloping it wisely could help give the whole town centre a new lease of life. The IMAX in Bournemouth. It should never have happened. The Home Office in St. James's SW1. A monster, totally out of character with its surroundings. For good measure you could add Knightbridge Barracks for the same reason. Both, I think, by Sir Basil Spence. The Buckinghamshire County Council Tower Block in Aylesbury. Stanley Kubrik used it as a location for A Clockwork Orange because it was a perfect representation of the bleak, dehumanised future. It hasn't got any better with age! Most of the Farringdon Road in central London! Concrete hell! It amazes me that all these ugly buildings stand empty, while the Corporation of London claim there is a shortage of office space and propose to demolish some of the beautiful Victorian Horace Jones buildings of Smithfield Market to put up more faceless glass fronted offices! Scandalous! It depends on who makes the decisions. Some buildings condemned as ugly 50 years ago are now becoming very desirable and of architectural significance. Any decisions need to be taken out of the hands of the members of RIBA, who have vested interests in building new properties and who don't have to live with the buildings in question. Let the locals decide, then give the 'grade X' listing. Sounds like an excellent idea! I vote for the monstrosities that line the South Bank in London - the National Theatre, the Shell Building and the Hayward gallery look like something out of a concrete nightmare! The BT exchange in Newbury Berks. This huge grey building with countless aerials sticking out of the roof, over shadows the small market town. Situated at one of the main gateways to the town it's an eyesore that would turn anyone away. The council keeps saying they want to improve the image of the town and attract more visitors, then they should take sledge-hammer to this building or charge to see it blown up. What on earth happened to town planning regulations during the 60s and 70s? Could the concrete mess known as Basildon Town Centre please be demolished! The Brunswick Centre, WC1. Brutalist offspring of concrete monster and giant greenhouse. Most of the shops are boarded up, and the fabric of the building is crumbling - and in some places, whole sections of wall seem to have fallen off. Parts are held up by seemingly permanent scaffolding. The fire escapes do look quite exciting though. Saving grace: the Renoir cinema. But it's not enough - in the words of Morrissey, 'come, come, nuclear bomb'. Poundbury. Prince Charles' pet social engineering project is obliterating one of the finest views over Maiden Castle - the largest Iron Age Hill Fort in Europe. What started out as model village made of twee housing is now an out of control sprawl of industrial units and social housing protected from planning scrutiny by virtue of being on Duchy of Cornwall land. Nothing has been learned from the social engineering fiascos of the 60s and 70s; the current encampment of travellers may well be the only genuine community that ever resides here. Please someone demolish the hideous monstrosity that is the car park in Gateshead town centre! A huge concrete eyesore, painted yellow, set against the beautiful Millenium bridge and sage music centre - it has to go! Please! To Sam Green- I'd demolish all the buildings around the Centerpoint. The failure of that building is the lack of surrounding public space, not the building itself, which is one of the few Modernist building in London to have escaped the brutalists. Small winding streets were all very well in Victorian London but light and air should be the focus of a Modern city. Modern Architecture does not always mean brutalist concrete or appalling 60s social housing. A building is there to perform a function, not just adhere to an out-dated "style" as many in the Prince Charles camp seem to think. London needs more good modern buildings and less pseudo-Victorian brown brick eyesores. The problem with "eyesore" buildings is that the decisions are so subjective and depend upon fashions. I worked on Centrepoint in the early 70s when it was being decried as an eyesore - now it is graded. The same for the Rotunda in Birmingham. My belief is that buildings are built always with the best intentions and only if they become dangerous should they be demolished. The Victorians demolished a lot of "eyesores" but wouldn't we love to have them now. The Broadgate shopping centre in Bath. A 60s design carbuncle in the heart of a Roman and Georgian world heritage city. Dark subterranean corridors and dirty mock Bath stone exteriors combined with cheap department stores and fast food restaurants. On the route from the train station, so for many tourists it is their first view of this wonderful city. Bath and North-east Somerset council should replaced this horror instead of wasting our money on the Bath Spa project - pseudo-Roman health spa for the well-to-do. A disgrace! The St. James Shopping Centre in Edinburgh is perhaps the ugliest building I have ever seen. I have had to walk past it many times on my way to work, and every time I marvel at how it ever got built in the first place. In a city as beautiful as Edinburgh, it does not belong there. It's even worse than the DWP building on West Port! An excellent idea. Though an admission from the RIBA that their members got it terribly, terribly wrong in some cases and left us with such things to deal with now wouldn't go amiss either. Carlisle Civic centre. An eyesore that can be seen for miles. Pull it down and make way for a farmers' market. Much more use to the people of Cumbria! The multi storey car park in Gateshead, of the Michael Cain 'Get Carter' fame, should be demolished it is grey, unused, ugly and totally pointless. Sorry 'Get Carter' fans but it is bad! The Giffard Hotel, Worcester. Shouldn't have been allowed in the first place; completely spoils the view of the Cathedral. Most of Coventry city centre. What were the post-war planners thinking of? Hove Town Hall, a disgusting concrete monstrosity! The Woolmead, Farnham, Surrey. Everything bad 60's design has to offer. Whole area is due for redevelopment and it is the one of the few buildings they aren't demolishing. Typical! Definitely Appleton Tower in Edinburgh - it's revolting. Voted the ugliest Edinburgh University building, with its falling tiles it makes the site look like a war zone, and is a real thorn in the Edinburgh city skyline. The Southgate Centre in Bath is an absolute disgrace to a beautiful city. Millbank Tower would be far more aesthetically (and functionally!) pleasing with some judiciously placed high explosive! What a cracking idea Mr Ferguson has come up with! Although as President of the Royal Institute of British Architects could it be that his motivation is less to rid the nation of eyesores and more to drum up some business for his members? One wonders how many of RIBA's members were responsible for the buildings that will inevitably make it onto the list. Either way, to see the demolition of such monsters as the cinema on Brighton's seafront, the Tricorn Building in Portsmouth and Walsall - all of it -can only be a good thing. Sainsbury's in Canterbury (near the cathedral) - a stark, modernist, shocker contrasting with a medieval masterpiece. Tear it down! It sounds like a good idea on paper. But how do you decide what buildings to be x-listed? A building that one person sees as an eyesore, another may see as fantastic. Beauty is in the eye of the beholder. Stirling Police Station and Stirling Council offices - built in the 1970s when people thought it was good to make giant egg box buildings. Along the same lines: St James' Centre, Edinburgh. One for the future - the £431+ million Scottish Parliament. Obviously the Scottish Parliament building should be top of the list. After four years and £400+ million we have ended up with a completely tedious office block which spoils the natural beauty of Holyrood Park behind it. Would it be possible to demolish Croydon? All of it, please! Coventry Station needs taking to with a demolition ball. Can I take first swing, please? Yes. A blacklist is required as some buildings desperately need to go. Local residents should have the final say after architects and art observers, simply because architecture/buildings have to be both functional and aesthetic. Top of the list: That great big pink shopping centre in Elephant & Castle, London. It's hideously offensive and if you walk through the area, you'll notice the grim effects on the faces of the locals. Demolishing this monster would be as liberating as knocking down the Berlin Wall was for the East Germans!